A classic Caesar salad with crisp romaine lettuce, shredded asiago cheese, and ciabatta croutons. Includes 1 bottle of Creamy Caesar Dressing. 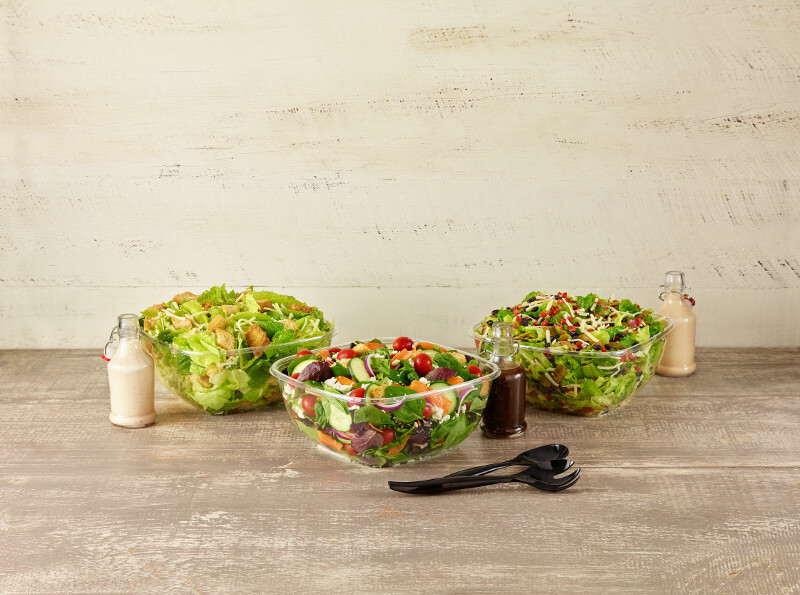 A fresh blend of mixed greens, romaine lettuce, shredded carrots, grape tomatoes, red onions, sliced cucumbers, and feta cheese. Includes 1 bottle of Balsamic Vinaigrette Dressing. Enjoy this flavorful salad made with crispy romaine lettuce, shredded cheddar cheese, black beans, crispy fried jalapenos, and fresh salsa. Includes 1 bottle of Roasted Poblano Ranch Dressing.